I am so excited to share with you today that I am a special guest for Tiddly Inks 2 year celebration with the theme, Frame the Moment! When Christy asked I was pleasantly surprised and super excited, it was with great pleasure I said yes! 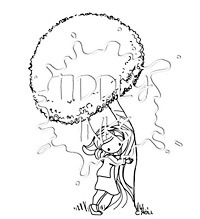 I was browsing the Tiddly Inks store and ran across this cutie called Tree Hugger. It instantly took me back to almost two years ago in the park where my little Samantha was caught in the moment of loving on a tree, much like this digital stamp, and I knew I had to work with it! See the resemblance? It's like Christy drew this image with my photograph in mind. 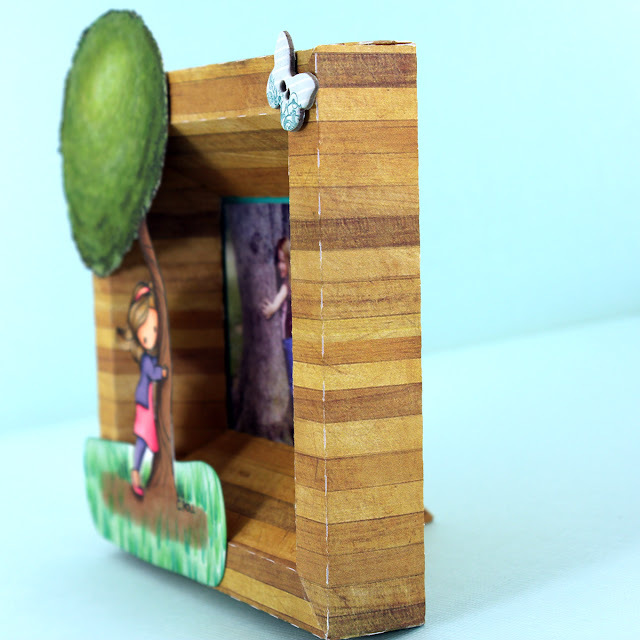 I colored her in copics and created this beveled frame from Lori Whitlock in the Silhouette online Store. Here's a side view, and it even stands up all on it's own. I realize the decoration was pretty sparse, but I honestly couldn't think of anything cuter than my Samantha framed in this paper bevel frame (which is quite sturdy) alongside that wonderful Tiddly Inks digi. Here it is on my mantle above the fireplace.. 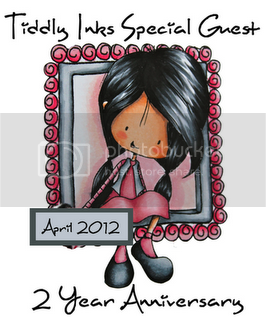 I think I will create two more of these with my other children in mind using different digital stamps from Tiddly Inks. It would be great if you headed over to the challenge blog to take part in all the specials going on.. join a challenge, say hi.. Thanks for always being great!! That is sooo cute! I have a similar picture of my Hannah! wow this is so amazing...you are so darn creative...I love this Leah...that picture is just so amazing..
oh my gosh sooooo cute!!!! Oh, wow! This is just fabulous! 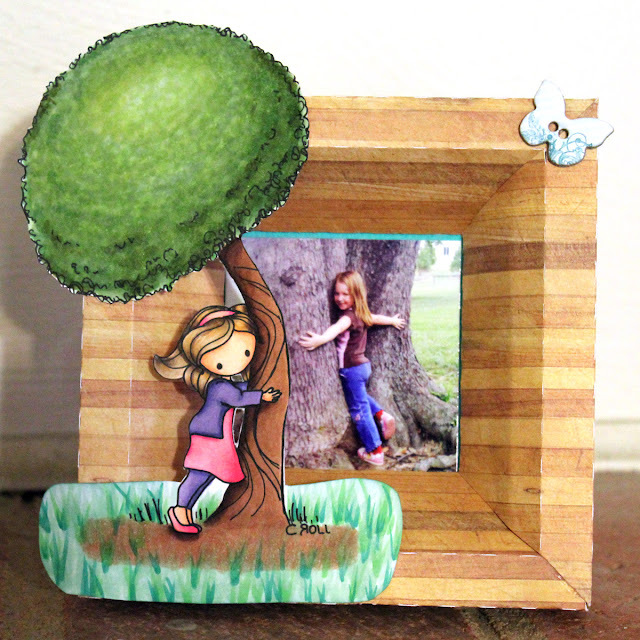 The photo is super cute of your daughter and I love the wood look paper you've used for the frame, it looks awesome as the background for Tree Hugger and your photo! Fab project! Leah - this is SO adorable! I love it and thanks for being a special guest! You rocked the theme and I love your tree! Gorgeous coloring! Leah your coloring of that tree is amazing! Great job with the photo box too! Thanks for joining in our celebration! Wow Leah! This is totally amazing! 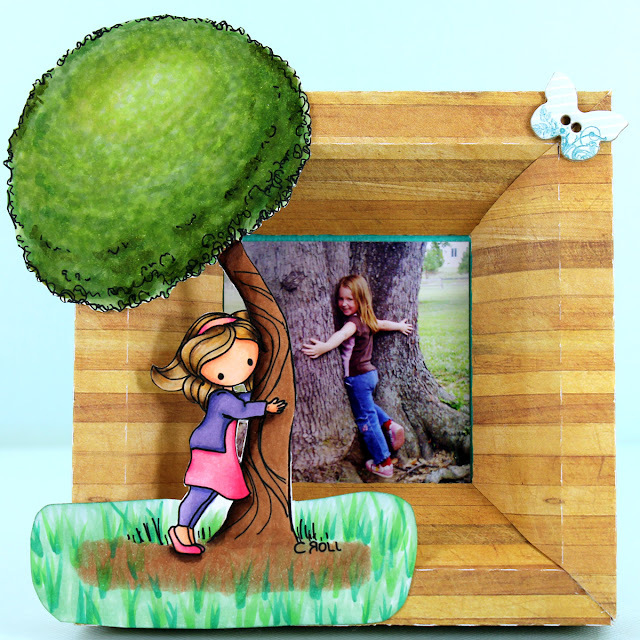 I love the frame you created and the image you chose is just perfect to go with your daughter's adorable photo! Fabulous colouring too! Ohhhhhh this is AMAZING!!! I loveeeeeeeeeeee that photo and loving the little girl hugging the tree!! ADORABLE! Wonderful! And I can totally see the resemblance! Ahhhh, that is soo special! What a great way to make a memory! Sooooo amazing Leah!!! I love every bit of it! Yo lady! I put one of your cards on the Designed To Color blog! You know... b/c you ROCk!!! This is just adorable and seriously girl, your coloring skills are amazing! Congrats on making GDT!! Leah, this is such a GREAT project. I love that you made your own frame. It's as cute as can be and your color work is amazing. How fun that you had a photo like the stamp. Awesome! seriously LOVE this. the image is absolutely PERF for such a fun little project! really does your photo justice and brings it all together! and, well, your COLOURING. whew! is it getting hot in here, or is it just me? !